Make new friends, learn new skills, and be a part of a community of support by becoming a Canucks Autism Network member today. At Canucks Autism Network, we value a sense of belonging where all families are welcome and appreciated and support one another through shared experience. We believe in every individual’s ability and welcome children, youth and young adults across the autism spectrum. To access Canucks Autism Network (CAN) programs, families must first complete an online membership application that includes an annual fee of $25 per individual with autism. Once members, families and individuals can participate in programs and events at highly subsidized rates thanks to the generous support of our donors and sponsors. Members can also take advantage of CAN Membership Benefits. An individual in the immediate family (i.e. a son or daughter, or the individual who is registering) must be diagnosed with Autism Spectrum Disorder. Individuals across the autism spectrum are welcome. We adjust our level of support based on the needs of each participant. Individuals and families wishing to register must live in British Columbia, Canada. How do I sign-up as a member? To sign-up for a CAN membership, individuals and families must first complete the online membership application. Proof of the individual(s) ASD diagnosis. The diagnosis must be a physician-signed document that clearly states that the individual is on the Autism Spectrum. The documentation may include the original assessment (the first and final two pages of the assessment usually meet the requirements) or a physician/psychiatrist signed note. Photos of each individual registered with the CAN Membership (including those without an autism diagnosis). Photos are used for internal purposes only and may be uploaded online through the individual/family’s CAN membership account. Once the online application is complete, CAN members may begin registering for programs and taking advantage of CAN Membership Benefits. CAN members can request a space in our programs and family events during specified registration periods throughout the year using their online membership account. Upon signing up for a CAN membership, you will begin to receive monthly email newsletters that contain information about upcoming registration dates, events and programs. The CAN newsletter is typically sent out in the first week of each month, and new members are encouraged to add [email protected] to their email contacts list to ensure the newsletter is not sent to junk. The website will always have the most up-to-date information about registration, program structure, supports provided, and age requirements, as well as other helpful resources. By liking the CAN Facebook page, you will receive valuable information and updates on programs and events as well as opportunities to enter contests and giveaways for Canucks tickets and other great prizes. Once you find a program you are interested in, login to your online account during the registration period to submit a registration request. The majority of our programs use a registration process called Pending Enrolment. This means that spots are NOT provided on a first-come, first-served basis, and that requests received are pending confirmation. Each program request immediately goes to Pending status. Those who submit registration requests during the online registration period will be notified of their updated registration status (either Confirmed or Waitlisted) within seven days of registration closing. The Pending Enrolment registration process is used so that we can accommodate as many unique individuals into CAN programs throughout the year as possible. It also allows for more participants to have the opportunity to try new programs and activities. For more details, please visit our We Heard You blog post on the registration process. Canucks Autism Network delivers programs across the Lower Mainland as well as in Kamloops, Kelowna, Victoria, Nanaimo, and the Cowichan Valley. All program locations, dates, and times, are available in our seasonal leisure guides. Training opportunities are available across British Columbia. Why don't you offer programs in my community? Some programs require members to pay a highly subsidized fee as a means to ensure program sustainability. Along with traditional payment options, we accept Autism Funding and sporting grants, including JumpStart and KidSport. What if I can't afford to pay for a program fee? At Canucks Autism Network, we value accessibility and strive to eliminate financial barriers to program participation. If a program fee is a barrier for you or your family, we encourage you to submit a request for fee reduction or waiver through our Fee Assistance Program. Please e-mail [email protected] for more information. Why don't you support all disabilities? 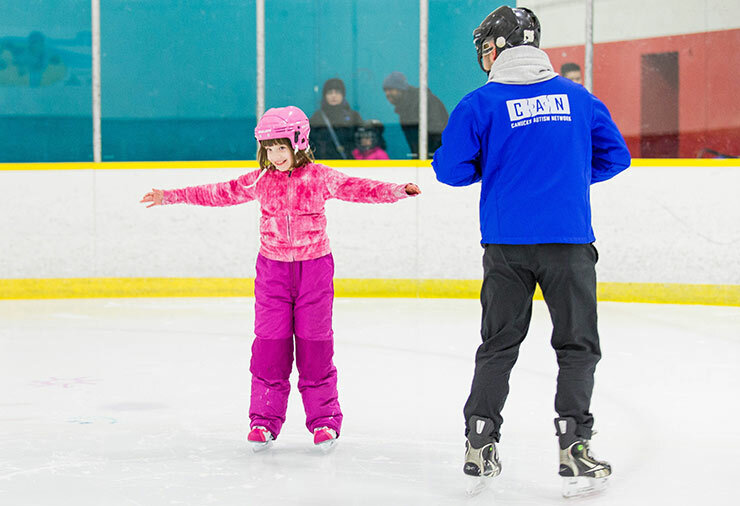 Since its inception in 2008, the Canucks Autism Network has been dedicated to providing high-quality programs that have been specifically designed and adapted for individuals living with autism. In addition, much of the funding we receive is specific to autism programming. My child is non-verbal. Can he/she participate in CAN programs? Absolutely! We welcome individuals across the autism spectrum and utilize a variety of strategies and a range of supports including visual schedules, first-then boards, token systems and social stories, to ensure that every participant is successful on their own terms. We can also adjust our ratio of staffing to ensure that your child is well supported. Do you accept children who can be aggressive towards others during a meltdown? Of course. Be assured that with parent collaboration and open communication, our experienced support team and highly trained staff are equipped to manage manage types of challenging behaviours. Can all ages participate in your programs? Why did my child end up on a wait list? Registration decisions are based on a variety of factors including the overall demand for a program, a participant’s registration history, and a family’s ability to access programming. Demand for most programs is quite high, therefore, participants will not be accommodated into every program they wish to attend. At Canucks Autism Network, our goal is to accommodate as many unique individuals into programs as possible, and registration decisions are made with this objective in mind. I am having troubles with registration. What do I do? If you are experiencing difficulties with the online registration process, please see our Frequently Asked Questions – Registration. If you still cannot find the answer you are looking for, please contact the office by email at [email protected], or by phone at 604-685-4049. Our helpful team will be able to look into the issues that you are experiencing, and help answer your questions. I would like to request a different program time. How do I make the request? We do our best to accommodate all requests, however, we ask that families be flexible. Participants are placed into specific time slots in order to accommodate as many unique individuals as possible. Families are welcome to request a program time change by emailing [email protected], however, not all requests will be accommodated. Will I get to meet Vancouver Canucks players? At times, Vancouver Canucks players may be present at CAN programs or events, however, we ask that families allow the players to participate in the activity and do not ask for photos or autographs. Can I get tickets to a Vancouver Canucks game? Although our founders are the co-owners of the Vancouver Canucks, we are a non-profit organization and a separate entity from Canucks Sports and Entertainment. Occasionally, we will receive complimentary tickets to games and they are offered to our members through a lottery system on Facebook. To ensure that you do not miss out on ticket giveaways and other important information, please follow us on Facebook. We are continually inspired by the strength, determination, and resilience of the individuals and families living with autism who make up our network. Do you have a story that you would like to share? We would love to hear about your journey with autism, whether as a parent, an individual on the spectrum, an employer, teacher, friend or other. Has Canucks Autism Network positively impacted you?